For the second year in a row, a struggling Ohio State team came back to beat Penn State despite being down big in the fourth quarter. The Ohio State Buckeyes, once again, have delivered one of the most thrilling games of the year. No. 3 Ohio State's 27-26 win over No. 11 Penn State was not the offensive shootout many thought it may be, but the matchup still provided us with a number of exhilarating moments. In today's Inside the Box, we will talk about how Ohio State trusted its athletes, how some breakout players made a name for themselves on the national stage, the improved play of the linebackers, and a tale of resilience that could be a bedtime story for future Buckeyes. The Buckeyes’ gameplan was pretty clear throughout the game; throw the ball short and let their athletes go against Penn State on the perimeter. The result? One of the weirdest statlines you will ever see. Dwayne Haskins’s 270-yard night on 56% passing will not hurt his Heisman chances and resulted in a huge Ohio State win, but his downfield throwing did not impress anyone watching. To investigate Haskins’s night, we will be using a statistic called “air yards”. Air yards are defined as the distance from the line of scrimmage to the mark where the receiver catches the ball. Everything after the catch is known as yards after catch (YAC). It should be noted that these numbers are unofficial, but have been diligently recorded and obtained. Haskins gained just 58 air yards on Saturday, his lowest mark of the season. 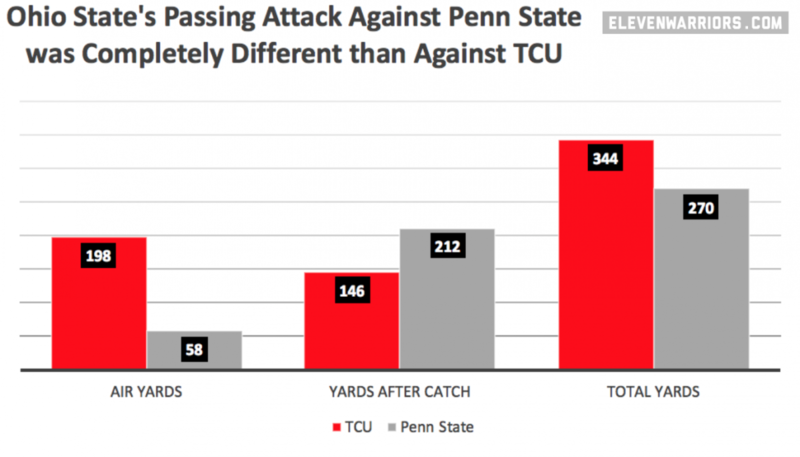 To put this into perspective, Ohio State had 56 air yards in the first two passing plays against TCU. Dwayne Haskins attempted just two passes over 20 air yards; they were both incomplete and intended for Austin Mack. Dwayne Haskins acted more as a distributor than the precise gunslinger we have seen in prior weeks. Throughout the game, Haskins trusted his coaching and made the right decisions. The Buckeyes’ ability to put their players in positions to succeed is the epitome of great coaching. Allowing Parris Campbell to utilize his speed to rack up yards after the catch while using Austin Mack as a possession receiver on critical downs proved to be the difference. As mentioned before, the Buckeyes relied on getting the ball to their playmakers. The beautiful part about this gameplan was Ohio State’s commitment to downfield blocking. Binjamin Victor’s amazing catch-and-run would not have been possible without Johnnie Dixon, Parris Campbell, and Rashod Berry throwing themselves in front of defenders. K.J. Hill never would have scored the game-winning touchdown without Austin Mack occupying a safety before Terry McLaurin took out three Nittany Lions. Even I know that not everything shows up in the box score. Binjamin Victor picked a perfect night to have a perfect night. Victor's 47-yard scamper was the second longest play of his career and his 55 receiving yards set a new season high. Most importantly, the junior receiver scored his second touchdown of the year in jaw-dropping fashion. There are no words or numbers that can do that play justice. Moving on, Chase Young has been a big name for Ohio State and a topic of discussion for weeks since the injury to Nick Bosa. He’s flashed potential throughout the season, but his performance on Saturday has put him on the national stage. He led his unit in tackles (six total, three solo) with three coming behind the line of scrimmage. 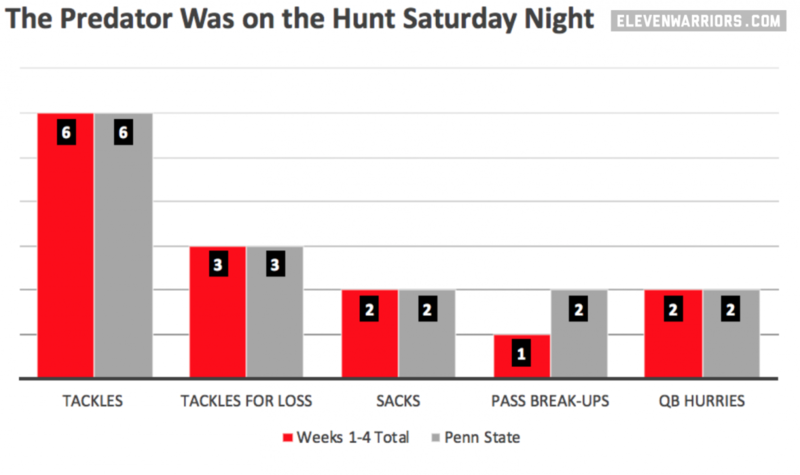 Young added two sacks and two pass breakups, which may have been his biggest contribution; his deflections came on third and fourth down and ended Penn State’s drives, one of which was inside the Buckeyes’ 25. It was the best game of his career and it is not close. Penn State was no match for the Predator. Finally, Drue Chrisman was the unsung hero against Penn State. In the first half, Chrisman punted the ball seven times while the offense struggled to put anything together. He averaged 47.7 yards a kick through the first half and hit a beautiful spinner to down the home team inside their own five in the second quarter. The average starting field position for Penn State following Chrisman’s boots was its own 22-yard line. In the first half, he kept them inside their own 20 on average. The Buckeyes lead the nation in giving their opponents a long field, which is a testament to both the offense and special teams. Ohio State forces opponents to go an average of 77.65 yards to the end zone and Chrisman is a huge reason for that impressive number. In the biggest game of the season, the linebackers played perfectly lights out their most complete game of the year. The linebackers accounted for 38% of the Buckeyes’ total tackles, their best mark this season. Tuf Borland and Malik Harrison tied Jordan Fuller for the most tackles on the team with eight. Pete Werner added five tackles. Harrison and Borland combined for 16 tackles (nine solo), including 1.5 sacks. It was their highest output of the season, both individually and combined. Borland’s forced fumble near the end of the first half was the first momentum shifter for the Buckeyes, who went on to score on the ensuing drive. The turnover was just the second the unit has caused this season but it came at the perfect time, springing the offense to life and giving Ohio State some momentum before the break. The unit missed tackles, as usual, but came through when needed. Borland, Harrison, and Werner combined for 7 fourth quarter tackles, another season-high for the trio. While the linebackers had their struggles, they complemented the rest of the defense well. The unit limited their mistakes and made the plays that were needed from them. Midway through the game, things looked bleak for Ohio State. There is no way the Buckeyes should have won this game. Based on Penn State’s points per yard average coming into Week Five (0.11 points per yard), the Nittany Lions should have scored 31 points by halftime. How did Ohio State survive? For one, Ohio State got off the field on third down. Penn State was just 1/10 on third down in the first half (the home team did convert a fourth down, but punted later that drive). Second, the Bucks relied on a bend-don’t-break philosophy. Sure, the defense let up a 93-yard touchdown (again) and now leads the nation in 60+, 70+, 80+, and 90+ yard plays allowed, but they forced Penn State into three field goal attempts in the first half. All things considered, the defense stood tall against an efficient offense. Finally, Ohio State was just more resilient. At times, they were not as talented as the Nittany Lions. At times, they could not handle the pressure of 110,000 fans in white screaming at them. But the Buckeyes never lost hope and made the plays that needed to be made. Once the halftime adjustments were made, it was just a matter of time. Ohio State, despite being outgained for the first time this season, was able to chip away against a top-ten team in the most hostile environment in college football without their best player. For the third year in a row, the team leading by two scores at some point in the fourth quarter lost the game. The Buckeyes proved that they are a national championship contender and are now in the driver’s seat to win the Big 10 East. Before fans can look ahead to November and beyond, however, Indiana sits on the horizon. According to ESPN, the Buckeyes have a 96.3% chance to win this game. Last year, Ohio State had an 89.7% chance to beat Iowa after an emotional game against Penn State. Before we look ahead to buying tickets in Indianapolis, let’s hope the Buckeyes stay focused for the task at hand.